Getting started with PeopleVine Project to manage your ability to deliver and handle deal flow projects. Allow people to submit project requests where your members can bid on them. Manage the entire project and deliverables through completion. Leverage the attribute engine to capture structured information on the project. 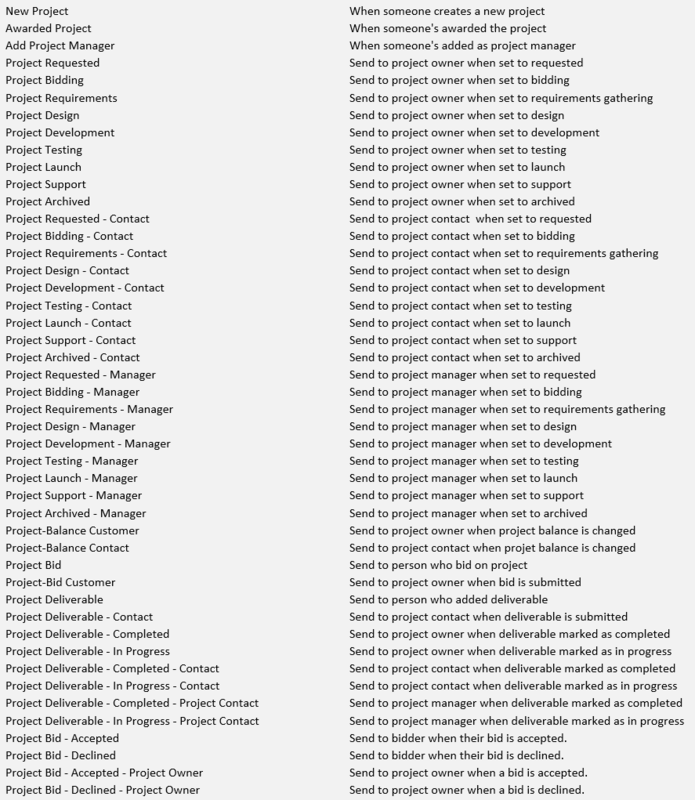 Attributes can also be used to filter available projects. Projects have 8 phases which each have different views/tools: (Submitted, Bidding, Finalize Requirements, Design, Develop, Test, Launch, Support). You can assign permissions to who can view, manage or even bid on projects. Projects are only visible by the public if you switch the project to bidding and the permissions are set to public. You can replace the confirmation page after submitting a project by creating a content page with the marketing keyword set to project_confirmation. We suggest you setup attributes that pertain to the data you want to capture. Remember, these can also be focused based on category in case you wanted to get more specific. Go to the Company Menu and click on Setup New Attribute under Tagging/Attributes. Select Used For to Projects and then continue to setup your attribute. Remember these are used to capture data when people create a project request. Continue to add additional attributes as needed. You can also separate into categories in order to prompt specific questions based on the category of the project. You can filter out the projects you are looking for (or in the submitted phase). Find the project you want to manage and click on edit. Review everything is accurate and then change the status to bidding to allow people to bid and see it in /projects. You can also set permissions to only allow specific membership programs to bid on this project.